Faster than fast. Quicker than quick. 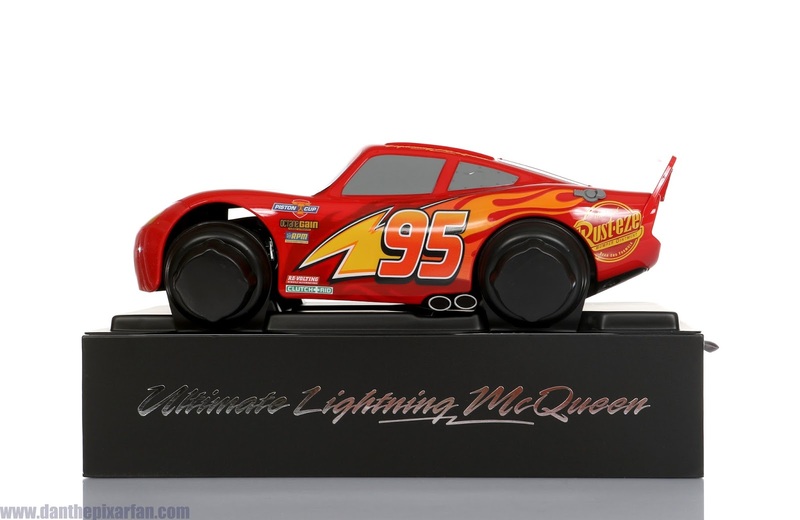 I am the ULTIMATE Lightning McQueen! Alright everyone, boy do I have a treat for you today. 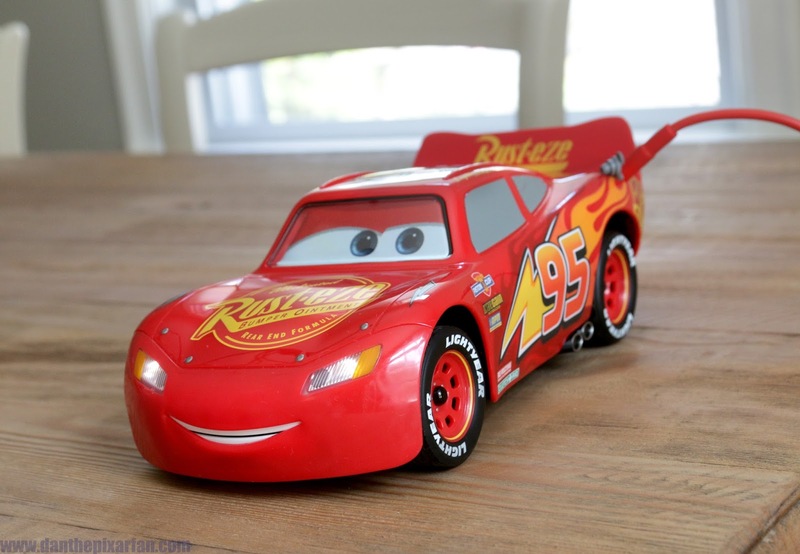 Thanks to the generous folks over at Sphero, I present my in-depth, hands on review of the one and only Ultimate Lightning McQueen app-enabled "RC" car. I say "RC" in quotes because this is much more than your typical remote controlled car. I hesitate to even use that term. The wizards at Sphero have literally developed a fully functional, fully animated, interactive machine utilizing the latest and greatest in technology. My mind was blown when I opened this up and turned it on; it was like McQueen jumped out of the movie screen and onto my desk. Note- This post is going to have a LOT of info, but don't get overwhelmed. It ultimately amounts to all being quite simple once you get your hands on it. I thought this was going to be complicated to figure out, but it really wasn't at all. I hope this post can provide some meaningful insights to those weighing whether to buy it or not (and maybe even answer some questions for those that do have it). 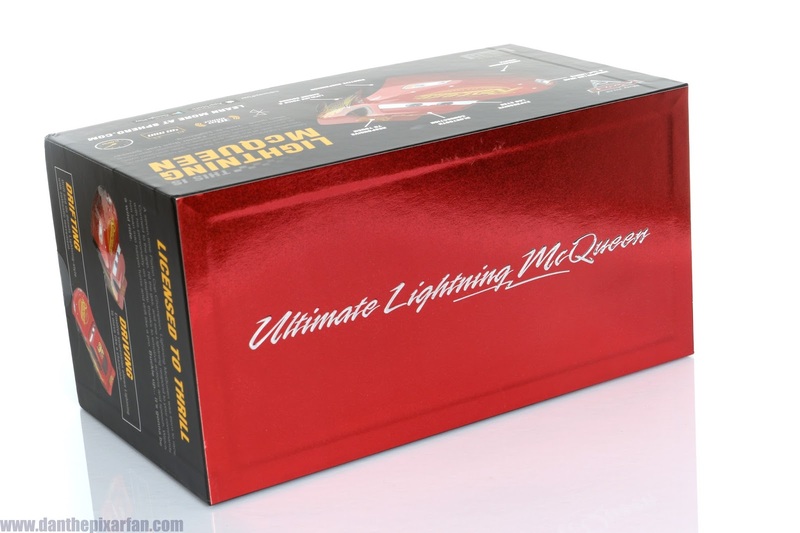 Before I get into more details about Lightning himself and what the heck the hype is all about, I first have to gush about the sleek packaging. Just the box alone lets you know that you have something special here. I absolutely love the red metallic shine that covers the top and the silver metallic embossed lettering throughout. Super clean and stylish. One thing you'll notice right off the bat is how heavy and study the box is. 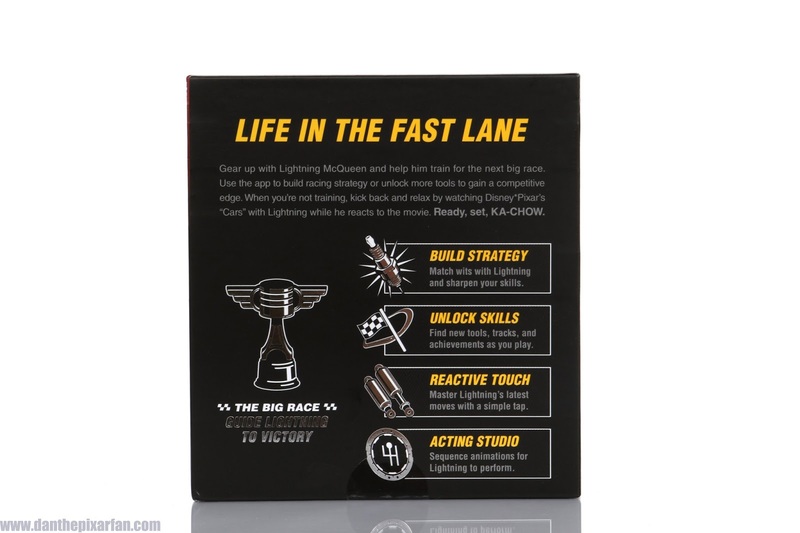 The back and sides of the box give a great overview of what you can expect while playing with this...toy? (I hesitate to call it that too :p). Responsive to Touch (thanks to five built in capacitive touch panels, Lightning will physically respond to a touch on his roof, hood, both side doors and near his rear window. He even knows when he's picked up and/or turned upside down and will respond with humorous phrases). 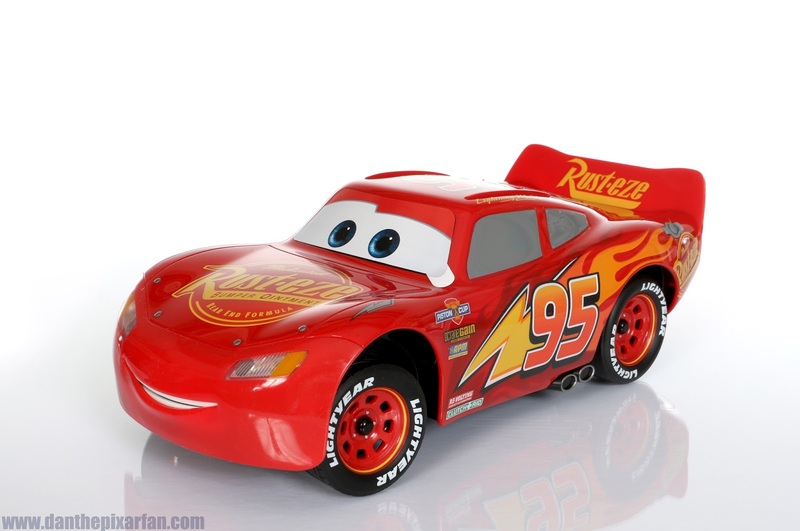 When you first take McQueen out of the box, you'll notice that he's attached to his base at the tires using little plastic caps. Just pop those off and you're good to go. Very simple. That leads me to my first point in that I like how simple this product is (as noted in my intro). Not simple in in the way that its made or the play value (quite the opposite), but simple as in that it's very user friendly and intuitive. This could have been an overly complex and frustrating item, but it's not. Additionally you'll notice his eyes are actually just a sticker overlay right out of the box. Just peel that thing right off. This was a nice touch so that you don't just see a big grey space there upon opening (remember, his eyes are LCD, so they're only there when he's charged and turned on), but it's not needed once you start playing. Slide out the drawer housed within the base and you'll find an awesome "McQueen Red" micro USB charger (love the color; super sweet detail) and the "Service Manual." And speaking of simple again? The instruction booklet is literally only three steps long. Again, they could have included a 50 page booklet, but I like how they kept things short, sweet and to the point. Most of what you need to know is taught to you once you actually open the app. Let's just take in for a second how breathtaking the look of this thing is! Just wow...or should I say KA-CHOW! His main body is made of a hard, durable plastic, while the mouth area is a softer plastic (also durable) to accommodate the animatronics (his mouth moves realistically when he speaks—it's just outstanding). He also doesn't have any paper stickers. Any stickers that may have been applied are under a fantastic, shiny protective coating. I absolutely love how glossy he is overall. I'm just so impressed with the attention to detail the team behind the scenes put into this. 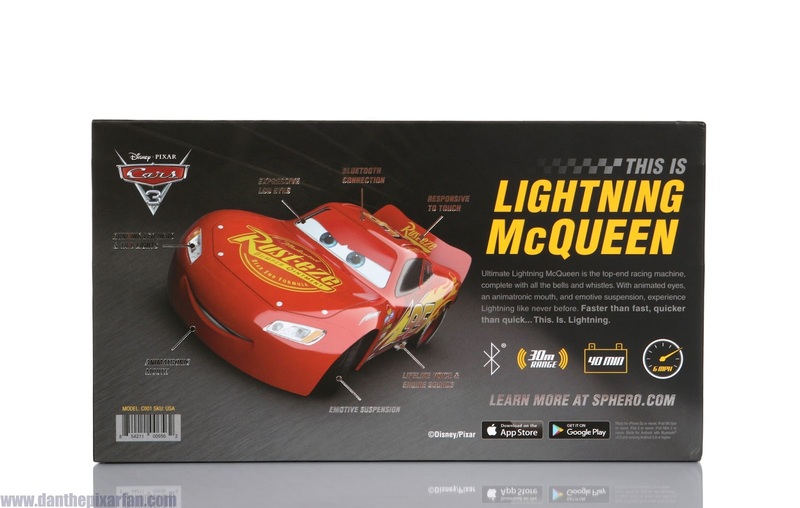 Sphero even worked closely with Pixar employees Jay Ward (creative director of Cars) and Bobby Podesta (Cars 3 supervising animator), who were involved with this project from the very beginning making sure everything was as accurate and true to character as possible (few know this classic character better than them). 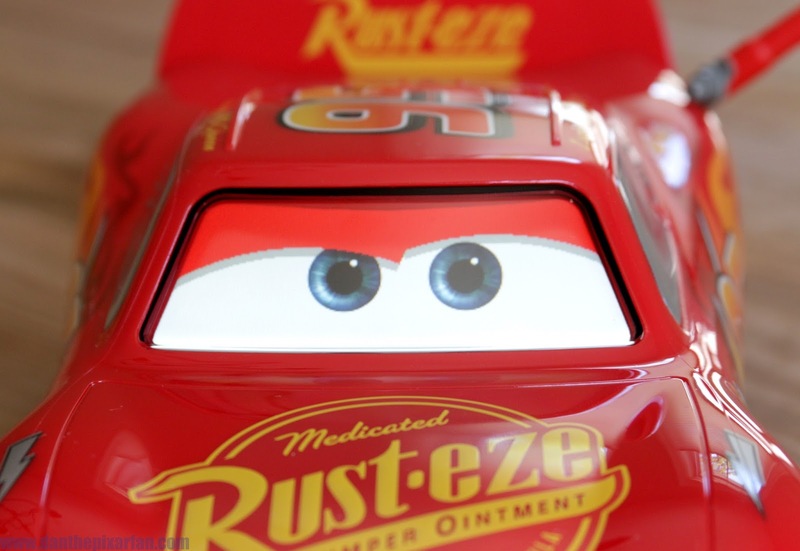 See Jay Ward talk about Ultimate Lightning McQueen in this video HERE and get your first glimpse of him in action. Ok let's get this thing out of my photography studio and into my home for some charging and some play. 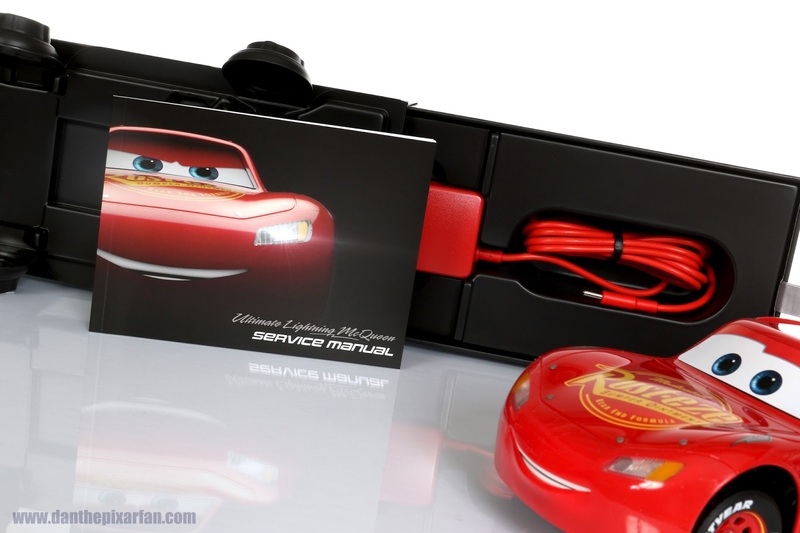 Step 2: Plug the included charger into McQueen's "fuel tank" to start the power flow (by the way, I thought that was a super clever place to put the charging socket; it's like you're fillin' him up with gas). Once he boots up, which takes about 30 seconds, he'll immediately start talking and responding to your touch. The initial charge takes 30 minutes. For future charges, while some sources say it takes two hours to fully charge Lightning, the official Sphero site says one hour (which matches my experience). Once charged, you get about 40 minutes of continuous play with him. 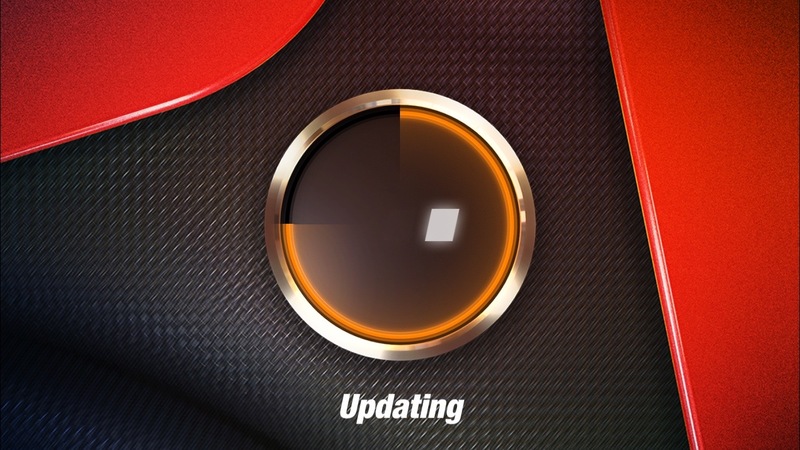 Note: battery level can also be checked at any time on the main drive screen or the settings page in the Lightning McQueen app. Step 3: Open the app and hold your device next to Lightning. Make sure your device's Bluetooth is turned on and has either Wifi or data turned on for updates. 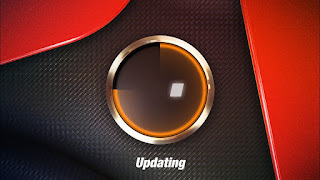 Wait for the update to complete and press start (as seen pictured in my screen shots below). Step 4: On the app (for first time users), speech bubbles will appear and guide you through the interface and tell you how to navigate the app. You can review these points at any time by pressing the red question mark button in the top left corner of the main drive/control screen (seen below). 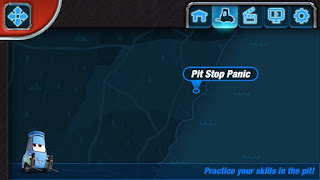 Step 5: Time to drive! 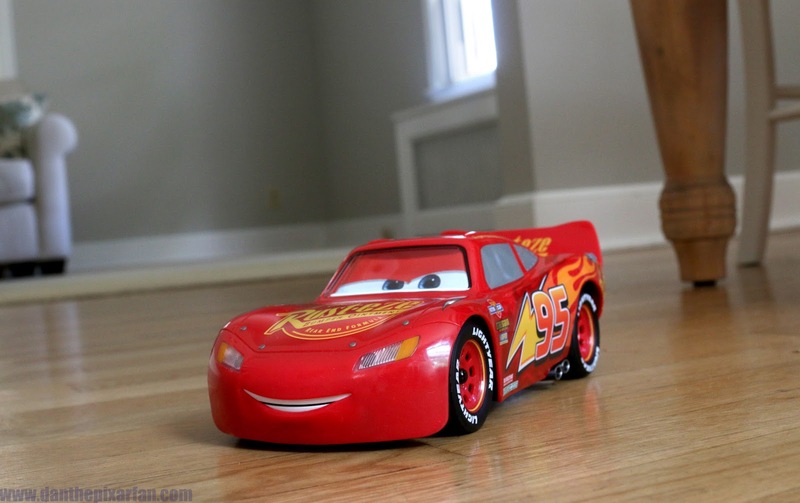 Unplug McQueen and place him on a smooth, solid, preferably clean floor (short carpet is just fine as well). Note: This product is NOT intended for outside use. His tires will no doubt get chewed up on pavement/gravel and he would most likely get super scratched up underneath him. This thing is definitely too high end to risk taking it outdoors, for me at least (especially since Sphero does not replace parts); but to each his own. He is also by no means waterproof. 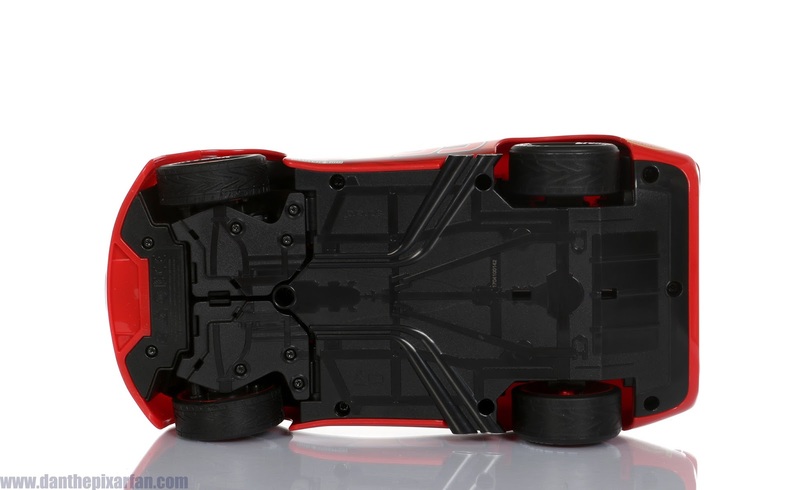 Here comes the learning curve as this does not drive like a typical remote control car. If you're not used to how Sphero products operate/are controlled (I have the 2015 Sphero BB-8, so I was used to it already), then it may take a little getting used to. 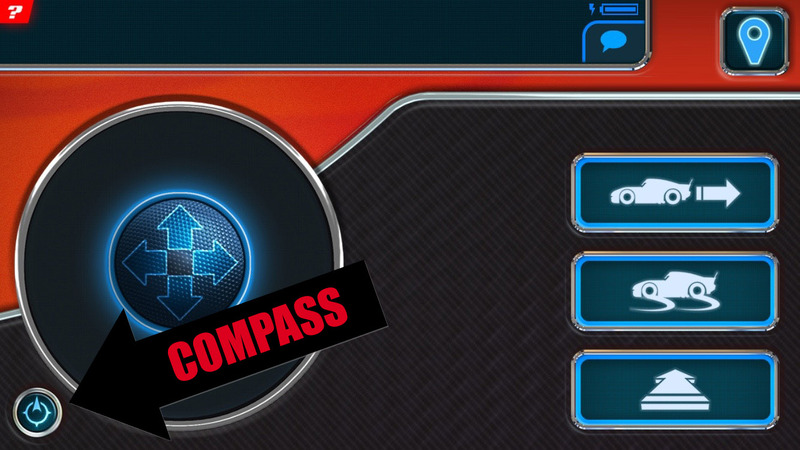 With the main drive screen opened, stand behind Lightning (so he's facing away from you) and then press the "compass" button (pointed out in my screenshot below) to orient yourself in relation to McQueen. From there, push up on the control pad/ joystick to drive Lightning forward and toggle it left or right to turn (pretty standard). Pulling down on the control pad, however, will NOT make him go backwards (even though it will be instinctive for you to do); instead pulling down will make him do a U-Turn. In order to go backwards, you need to hold down the reverse button at the same time as using the controller. There there is also a "donuts" button (hold that down while driving to make McQueen spin out and do "donuts") and a speed boost button (hold that down while driving to make McQueen go faster). Touch the speech bubble button (near the top right) to make Lightning talk at any time—even while driving. Lastly, as I touched on briefly earlier, the small battery icon above the speech button gives you an idea of where your battery level is. 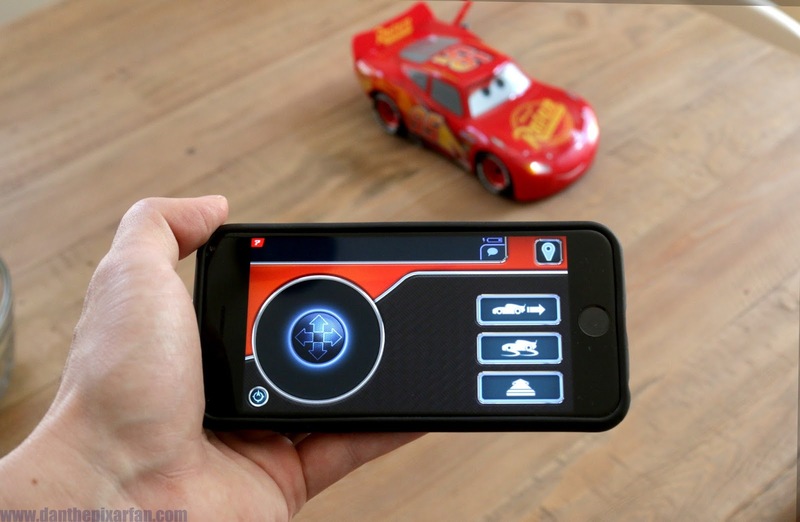 To learn more about how to drive Ultimate Lightning McQueen, Sphero has actually created a handy video tutorial that will help set you on the path to becoming a great driver (of McQueen, that is). Check it out HERE. 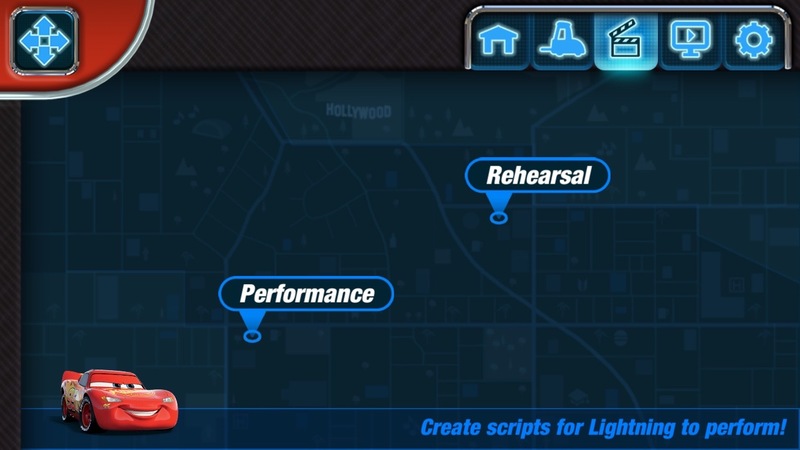 Hit the map icon button in the top right corner to give you the tabbed menu options. 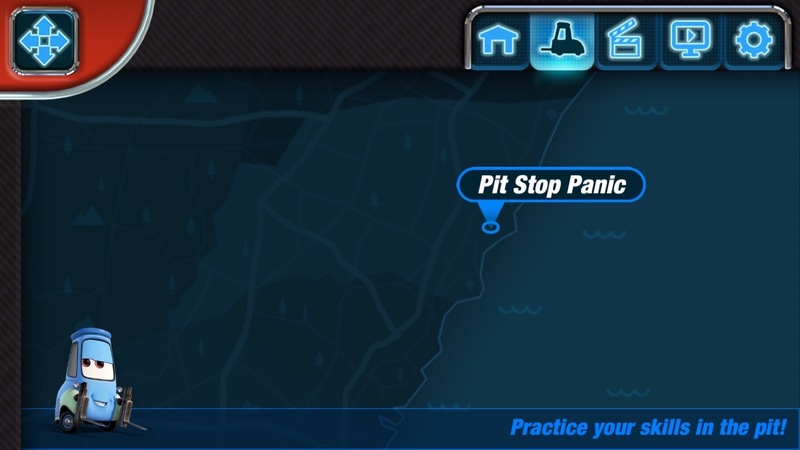 One of the options there, as mentioned, is the "Pit Stop Panic" game. This is pretty fun, but what was really cool for me was hearing McQueen comment on exactly what's going on during gameplay. He knows! 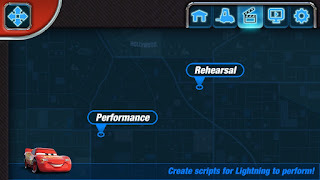 There is also the "Acting Studio"; this is where you can drag and drop any lines of dialogue into a given "script" and place them in any order for Lightning to preform. 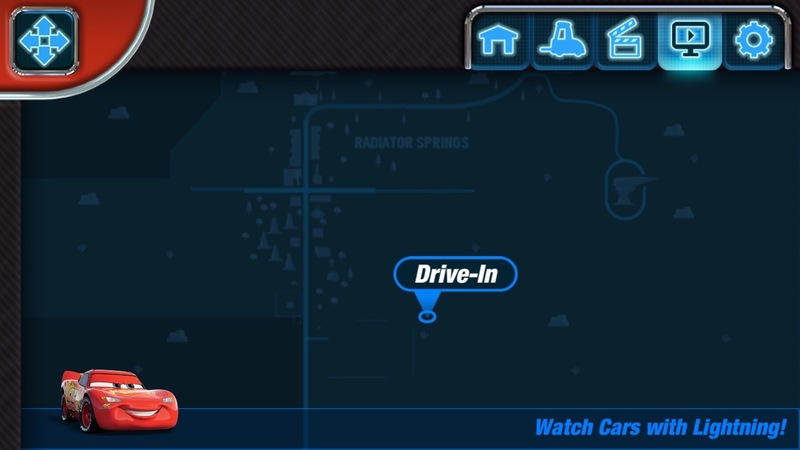 The "Drive-In" is where you can watch the original Cars with Lightning and he responds appropriately to specific moments! This is an amazing feature. His reactions are too funny and I just marvel at how it all works. 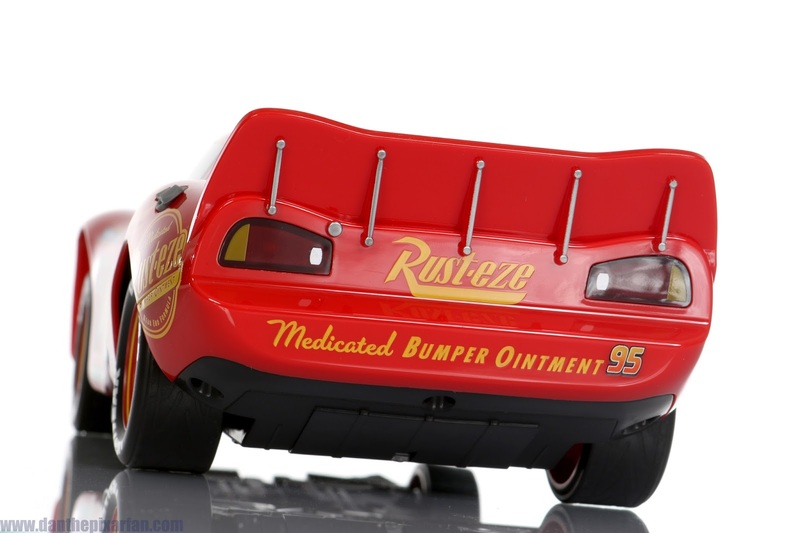 For example, when Chick Hicks hits another racer during the film's opening race, McQueen responds "Totally uncool Chick!" 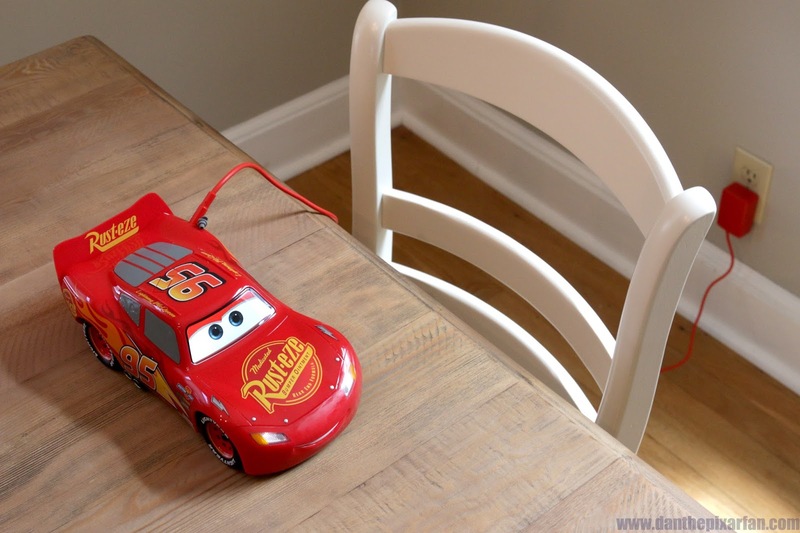 Note: McQueen has to be plugged in for this feature to work. 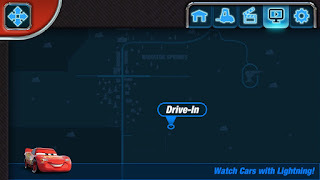 So far, there is no option to watch Cars 2 with Lightning...bummer I know. 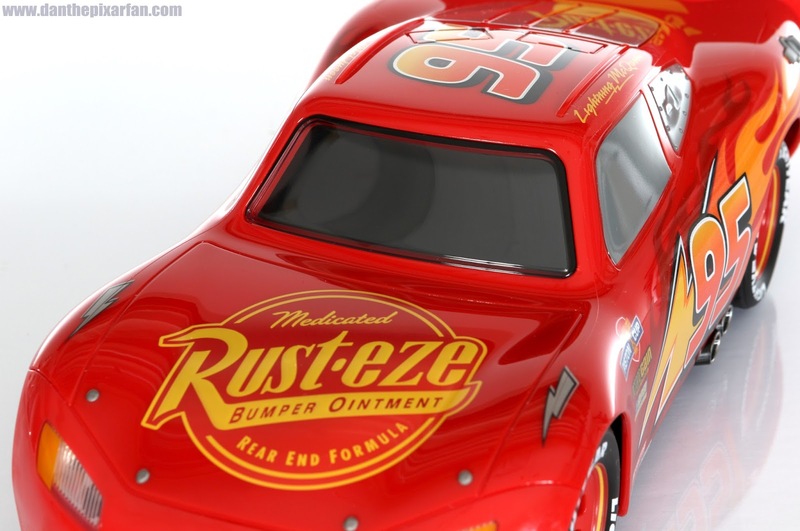 Lets hope that will be included in a future update down the road as well as Cars 3 once it arrives on home video! 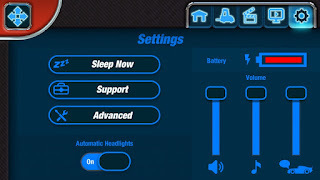 Important Turning Off Info: How do I turn Lightning off when not in use? Well, there are three ways. First, 20 minutes of inactivity will put Lightning to sleep automatically. Second, if you'd like to put him to sleep sooner than that, go to the settings tab (gear icon) and press "sleep now." After he goes to sleep, force quit the app so it doesn't reconnect and make him wake up. 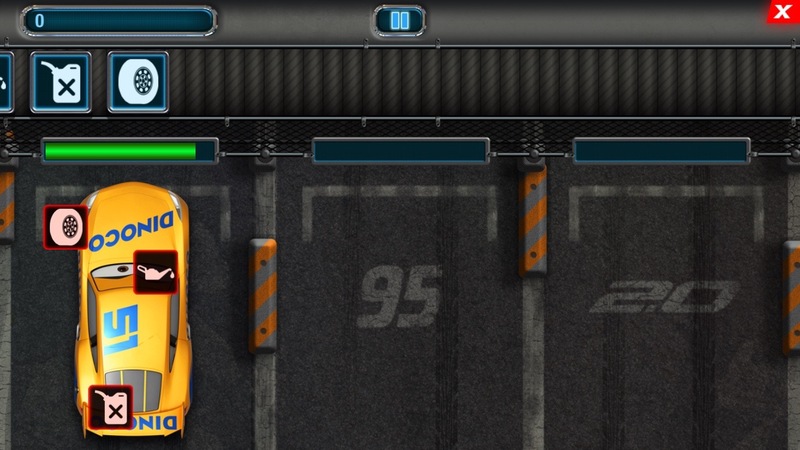 To turn him on/resume play, just open the app near him and he'll come alive again—ready to race! 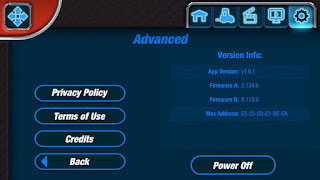 Third, to power down McQueen completely (for longer term storage), tap the "Advanced" button under settings and touch "Power Off" (seen below) McQueen will totally shut off. In order to power him up from there once you're ready to play again, all you need to do is insert his power cord just like you're going to charge him. He'll start right up, never having missed a beat. 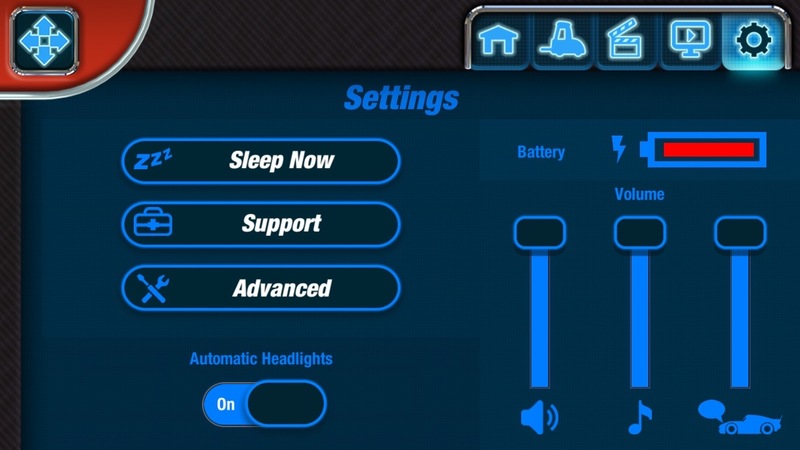 Additionally under settings, you'll find all the volume controls, a larger battery level display and the headlights control (you can turn them to always on or automatic). 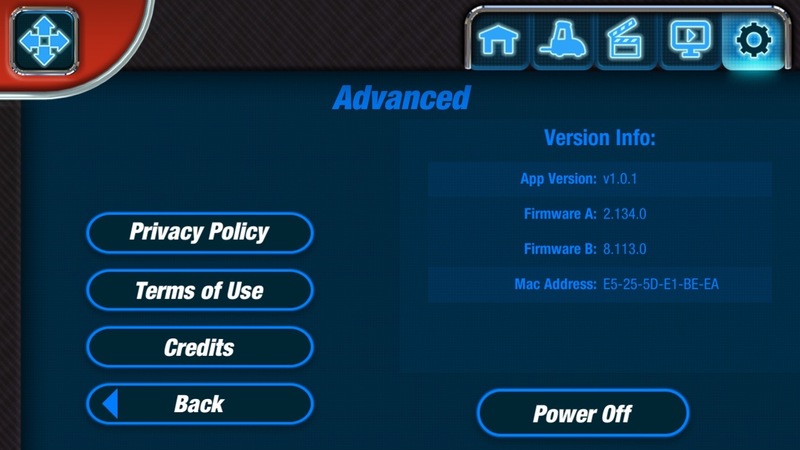 Under "Advanced" is where you'll also find all the version info. Cleaning Process: One of the very first things I noticed when I started playing with this McQueen was that his front mouth area (the soft plastic) is a little sticky. That being so, when you drive him around, he inevitability attracts some dust, hair and fuzz there. When I went to clean him, I tried damp paper towels, cloths and napkins and all of them left even more residue. THE SOLUTION? 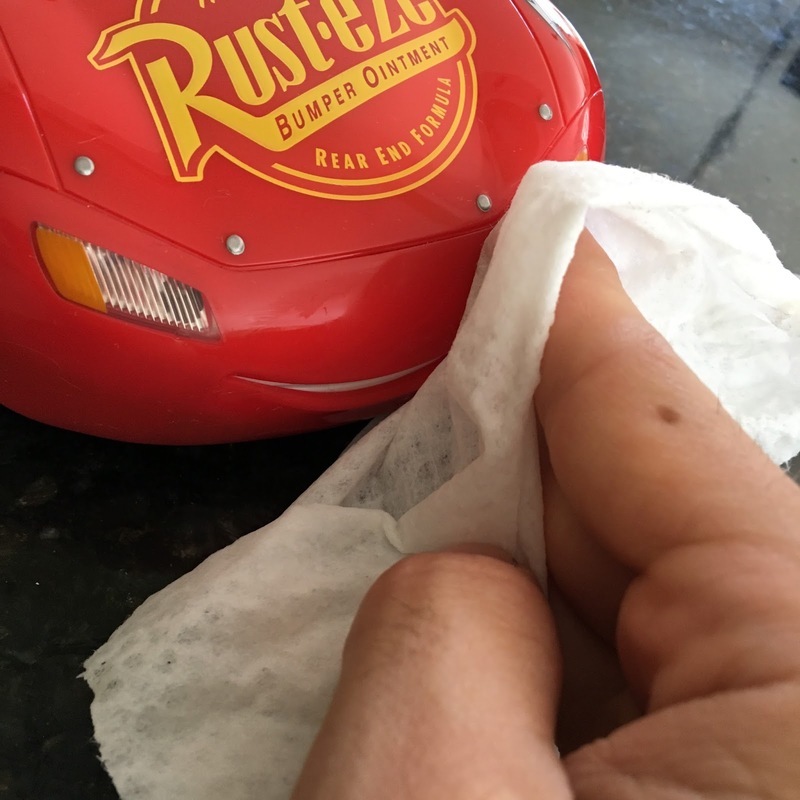 Sanitizing or baby wipes. They work like a charm. Wiping that area down with those after play will help McQueen retain his pristine presence. I've done it numerous times and he's left shiny like new every time. 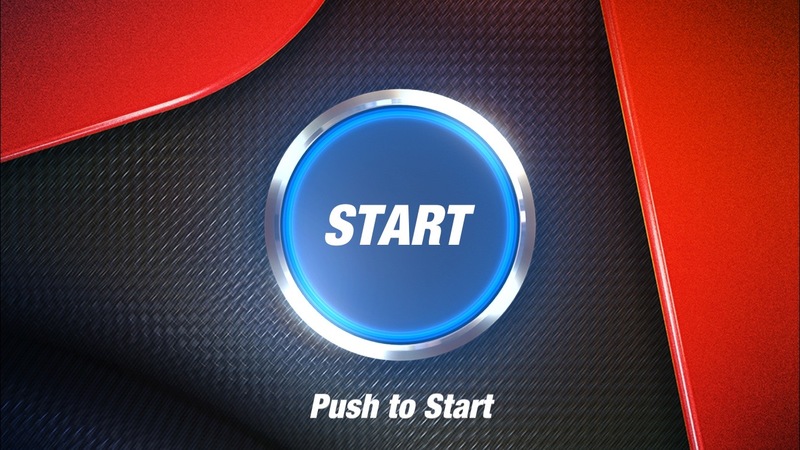 You might be wondering about the "building strategy", "unlocking skills", "finding new tracks & tools", etc. as noted on the side of the box. That's one thing that I was a little confused about, but then I think I stumbled upon the answer. 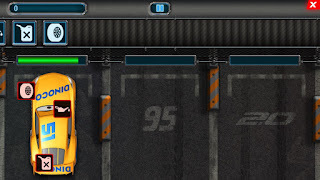 Apparently a new "racing" feature will be integrated into a future update and I assume those will have to do with that. What do you think? 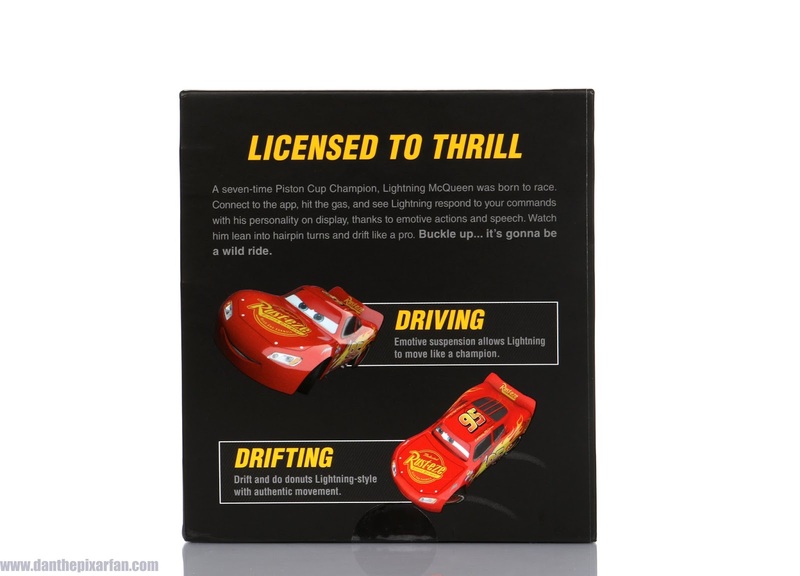 The recommend age range for Ultimate Lightning McQueen is 8 and up, but I'm thinking older Cars fans/serious collectors will get more out of owning this. The price, as you probably already know, is a doozy. This McQueen retails for a whopping price of $299.99, a price that is honestly well earned (given all the sophisticated robotic technology that resides in this guy), but hard to swallow nonetheless. The moment I saw this in action in person, it really knocked me off my feet. 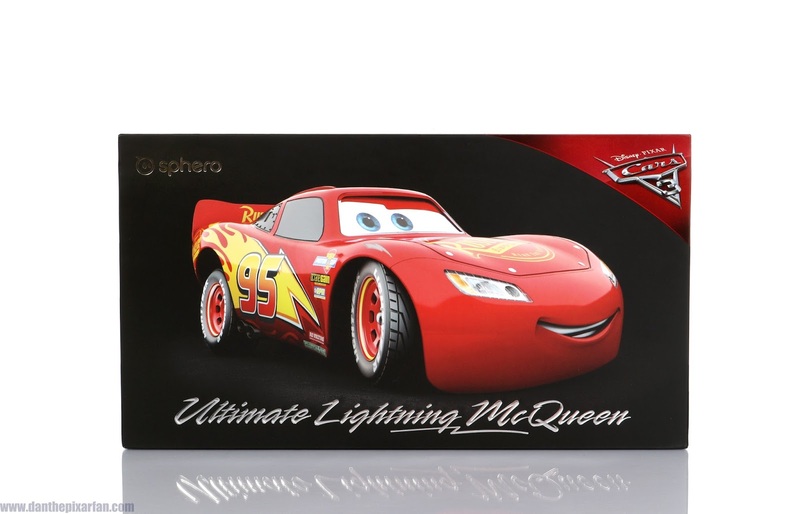 I just LOVE the realistic mouth moments, the expressive LCD eyes, the working lights and overall make of this incredible car. It still blows my mind how loud and clear his voice is/sounds are, how smooth he drives and drifts and how simple everything is laid out. The way that Lightning leans when he turns and the emotive suspensions (even when he's just sitting there talking; subtly moving up and down / left and right as he says his phrases) adds so much of Lightning's personality to this product. It's truly unlike anything I've ever seen in a "toy." Have you seen the animatronic cars at Cars Land (specifically Radiator Springs Racers) in Disney's California Adventure? This is like a small scale version of one of those—that's my best comparison. As far as any problems or glitches, I haven't had any personally. It's run smooth for me since the moment I plugged it in. If anything, the price could be considered a pretty massive con, but I understand why it is what it is. Some people might not like the driving controls (I know there's a learning curve that requires some patience), but for me, I don't have any major complaints rights now. I'll be sure to add to this post if anything comes up though! I can absolutely highly recommend this to any massive Cars fan. If you're a collector who's been invested in the franchise like I've been, then this might be considered a "must have." Visit the direct Amazon link below to purchase (also available at Toys R Us, Target and the Disney Store). If you have any questions at all, please email me or leave them in the comments section below and I'll be happy to help. My hat goes off to the entire Sphero (and Pixar) team for this achievement!